A fractured, or broken, ankle can result in either minimal damage that allows you to put weight on it during your recovery, or a significant amount of damage, requiring you to stay off your feet quite a bit. 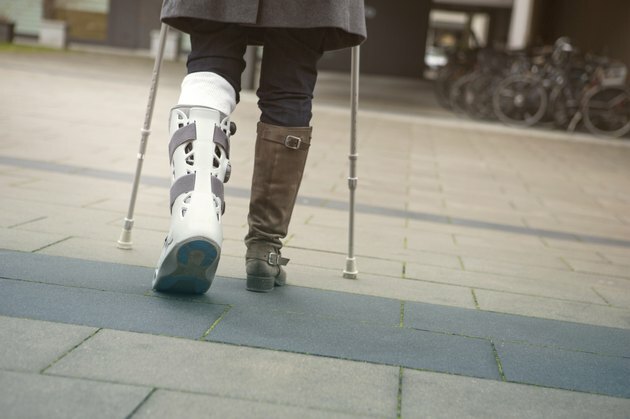 Multiple fractures can keep you entirely off your feet for up to three months. According to the American Academy of Orthopaedic Surgeons, ligaments also may be damaged when you break one or more bones in your ankle. A brace or cast may allow you to continue with a mild exercise program or you may require surgery and intensive therapy to regain use of the leg. Losing weight with a broken ankle requires a different set of exercises and reduced caloric intake to compensate for your lack of physical activity. Count the number of calories you usually burn during your normal exercise routines. Reduce your calorie intake sufficiently to compensate for the inactivity. Consider your basal metabolic rate and try to consume just enough calories to stay healthy. Most people need between 1,800 and 2,000 calories to maintain their weight with no exercise. Reduce that amount to lose weight while you cannot exercise. According to the National Institutes of Health, women should eat a minimum of 1,200 calories a day to remain healthy and men need at least 1,500 calories per day. Continue to build upper body muscles while you are bed-ridden or unable to put weight on your broken ankle. Muscles burn more calories than fat and will help you to continue to lose weight as you recover. Sit on a chair with your injured foot elevated and hold a set of free weights. Raise one arm over your head and lower it 20 times. Repeat on the other side. Perform biceps and triceps curls with weights. Perform crunches and sit-ups while sitting on the floor to keep your core strong and stable. Start with ankle rotations to maintain mobility in your leg. According to the Sports Injury Clinic, one of the first exercises you should undertake following a broken ankle is to move your ankle in complete rotations. While sitting with your leg extended, bend your foot forward as far as you can. Hold it for five seconds and release. Bend it back and then once to each side. Keeping up with small rehabilitative exercises will keep your energy levels up to perform other exercises and stay on your weight loss plan as you recover. Keep your injured leg flexible with stretches you can do while you wait to return to your regular exercises. By remaining flexible, you'll be able to resume your normal exercises quicker than if you allow your leg to atrophy. According to the Summit Medical Group, you should extend your injured leg so that your knee is straight and loop a towel around the ball of your foot. Lightly pull the towel towards your body until you feel the stretch in your calf. Hold for 15 seconds, release and repeat 10 times. While you are laid up with your broken ankle, you may become depressed; after all, it could take up to two years before you can return to your intense sports activities. According to the American College of Sports Medicine, it is common for athletes to experience some level of frustration and depression following an injury that takes them out of action. Talk to your doctor or to a mental health professional to prevent depression that could lead to overeating and weight gain. It is important to follow your doctor's instructions about putting weight on your ankle and performing weight-bearing exercises. The ankle can move out of place and heal in an abnormal position, leading to poor balance and arthritis. According to the American Academy of Orthopaedic Surgeons, putting weight on your ankle too early may cause the surgery to fail and require additional surgical interventions.